Warren Cariou grew up on a farm in Saskatchewan and has worked as a construction worker, a technical writer, and a political aide. He holds a Ph.D. in English from the University of Toronto and now teaches Aboriginal Literature at the University of Manitoba. His first book, The Exalted Company of Roadside Martyrs: Two Novellas (Coteau, 1999), garnered rave reviews, and his memoir Lake of the Prairies won the Drainie-Taylor Prize and was nominated for the Charles Taylor prize. POWERFUL, FUNNY, MOVING AND PERSONAL, LAKE OF THE PRAIRIES IS A RICHLY LAYERED EXPLORATION OF THE UNIVERSAL CHILDHOOD QUESTION: WHERE DO I COME FROM? Just over the Montana border is Eastend, Saskatchewan, home of Wallace Stegner. 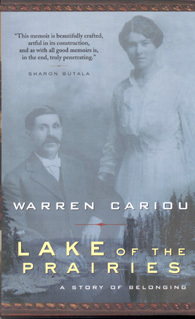 Warren Cariou's story begins 400 miles north of there, in a town located in a part of Saskatchewan that does not exist in popular imagination: a treed province of rocks, water, and muskeg. Removed from prairie traditions, Meadow Lake is enclosed in the ethos of the north, where there is magic in a story and fiction is worth much more than fact. Grounded in the fertile soil of Meadow Lake are two historical traditions —- Native and settler. Cariou's maternal grandparents were European immigrants. Their stories lived alongside Native legends in Cariou's boyhood imagination and as he dug for arrowheads, spear points, and stone hammers, he stumbled upon evidence of centuries of Cree setlement in the area. But the tragic history of how these traditions came to share the same home would remain hidden from Cariou until much later. In the schoolyard and on the street corners he witnessed the discrimination, distrust, anger, and fear directed at the town's Cree and Metis populations — prejudices he absorbed as his own. As an adult Cariou has been forced to confront the politics of race in Meadow Lake on a number of occasions — some horrific, others surprising. He learned that Clayton Matchee, a rambunctious Native boy with whom he had gone to school, had been taught to hate so profoundly that he could be involved in a torture and murder that would shock the world. And then Cariou discovered secrets that his family had kept hidden for generations, secrets that would alter forever his sense of identity and belonging in Meadow Lake.